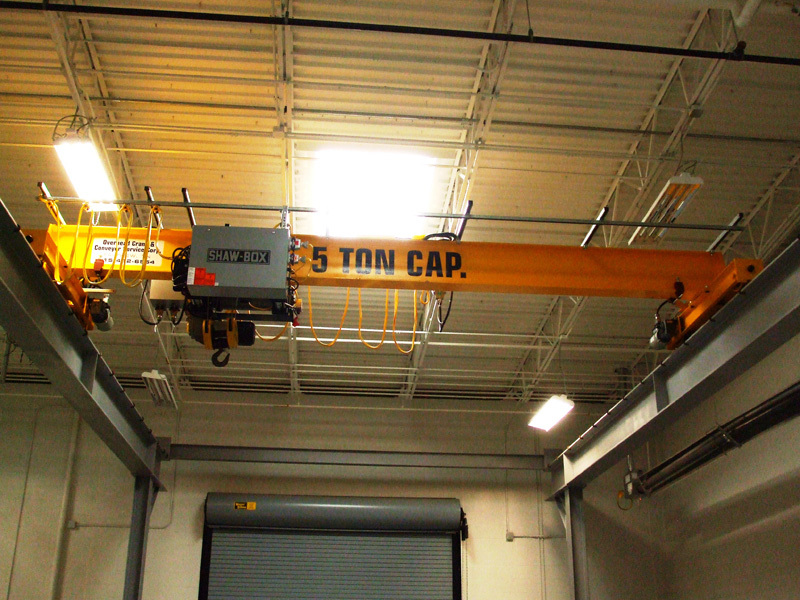 At Overhead Crane & Conveyor Services, we can find solutions to unique crane installation challenges. The project highlighted here was completed in 2011 for a customer in the construction industry as part of a new building fabrication project. Their customer in the natural gas industry had requested the installation of a 5-ton crane system in the main area of the facility as well as a jib crane in another area. They had originally envisioned the cranes to be attached to the building, but there had been a miscommunication with the principal engineer, and by the time we were contacted, the building had already been constructed without the necessary supports for an integrated crane. When we visited the jobsite to assess the location, we found multiple obstacles that prevented the installation of the crane as designed. A bathroom door, overhead door, and eye wash area had all been positioned too close to where the columns needed to be in order to make the initial design feasible. To work around these obstacles, we developed a design in which the column placement was moved toward the center and longitudinal support miter cuts would be placed to the outside, out of the way of the other equipment. We marked the layout on the floor to provide a visual representation of the new design to the customer. After the design was approved, the cranes were fabricated and installed two weeks ahead of the four week schedule. The finished crane system measured 40' in length with a span of 25' and was painted safety yellow, according to the customer's specifications. By visiting the site we were able to provide the customer with a crane system that fit their facility while not intruding on other equipment that had already been installed. For additional details about this custom overhead crane installation project, see the table below, or contact us directly. Continual checking of span trueness and exactness performed all related started-up activities.